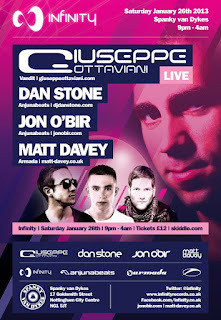 After the great success of their debut event, that sold out well in advance, Infinity return in this 2013 with another huge line-up. As usual, you can find all the information and details at the official event in Facebook. 26Th January, from 21:00h to 04:00h. Tickets: £12. The club: Spanky van Dykes, 17 Goldsmith, Nottingham City Centre, NG1 5JT. And you can get your ticket here. 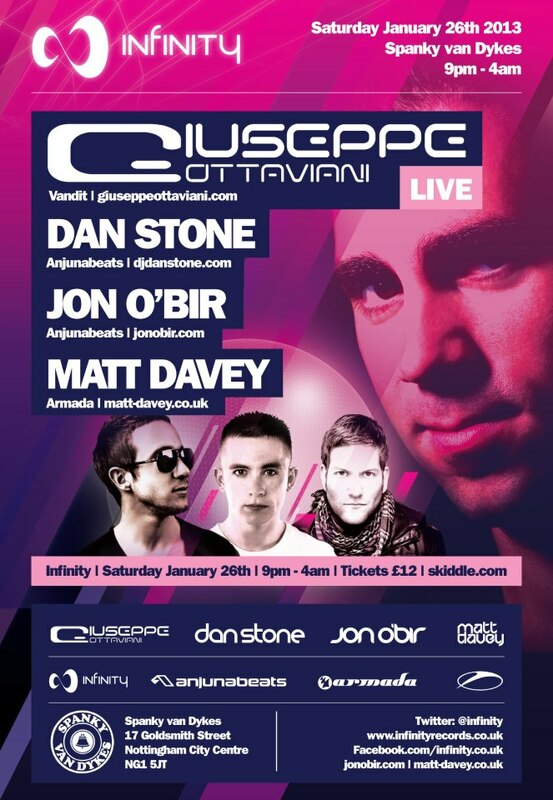 Giuseppe Ottaviani - A true pioneer of the uplifting Trance sound, formerly of the legendary NU-NRG duo. Giuseppe is one of only a few producers around the world who deliver such high levels of consistency in each production, time and time again delivering big vocal anthems, driving basslines and emotional filled melodies. The past six months have seen Giuseppe release the spine tingling "Falcons" collaboration with Solarstone, the classic textured "Arcobaleno" collaboration with Sean Tyas, along with several other stunning vocal singles too. Not forgetting his epic remix of the Paul van Dyk & Plum anthem “I don't deserve you”. Dan Stone - One of the well established Anjunabeats artists, Dan Stone fits in perfectly with the Infinity direction, style and sound. Constant A-list support since 2005 has earned Dan a well respected reputation for outputting top quality productions. Recently Dan collaborated with Nitrous Oxide to create the superb Progressive number "Nautica", he has also remixed Tritonal and his latest remix of "Nightshift" was extremely well supported just like his latest release on Tool Records "Drive". Matt Davey - The future is looking very bright for Infinity and also for our resident Matt Davey, quoted as one of Armin van Buuren's favourite Trance producers of 2012. Two chart topping number One releases this summer on the famous A State of Trance label have helped Matt establish himself as one of the leading Trance producers of the next generation. His recent releases, "Believe In Me", "Oblivion" and "Slipstream" have all picked up huge A-List support and have been extremely well received by the Trance faithful.